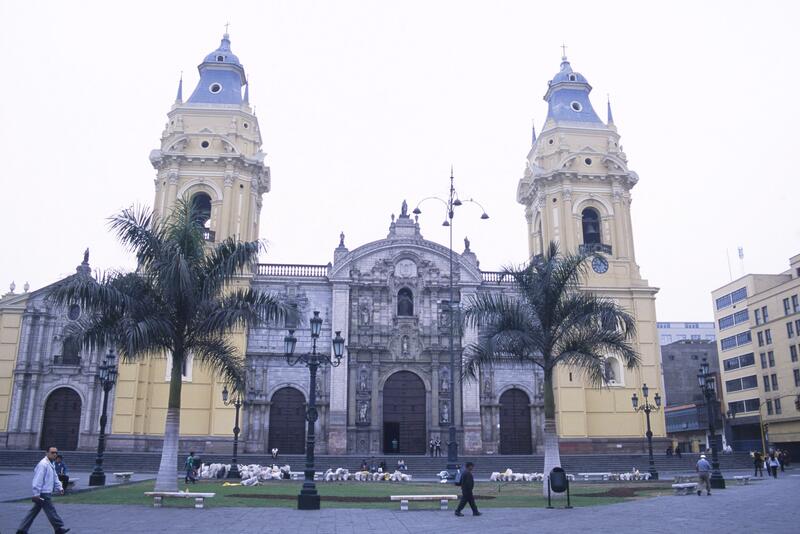 Through the colonial period, the Plaza de Armas was the center of Lima. In an adjacent market, international goods shipped into the nearby port of Callao were sold. The earthquake of 1746 largely destroyed the city and shattered the regional economy. When the city rebounded in the 20th-century, development moved to its southern edge and the wealthy followed with their businesses. During the colonial period, the plaza in front of the Cathedral was used for bullfights—popular entertainment during festivals. A fountain in the center of the plaza, built in 1650, was a (then) crucial civic service, as few homes had running water. The streetlights were “modern” amenities, introduced in the 18th century, to make dark cities safer at night. Mansions with screened in porches once lined the streets around the Cathedral, as wealthy owners sought to be close to the Viceregal epicenter. Today, the remaining colonial buildings give a sense of the scale of the early city. 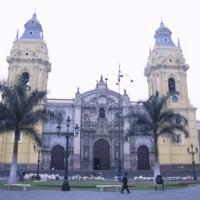 Francisco Pizarro, the conquistador of Peru, founded Lima’s cathedral and the Plaza de Armas (“Plaza of Weapons,” i.e. a military parade ground) in the 16th century. San Cristóbal Sebastián, Antonio. 1992. Lima: estudios de la arquitectura virreinal. Lima: Epígrafe Editores.